You might be born into a certain generation, but this quiz knows otherwise. 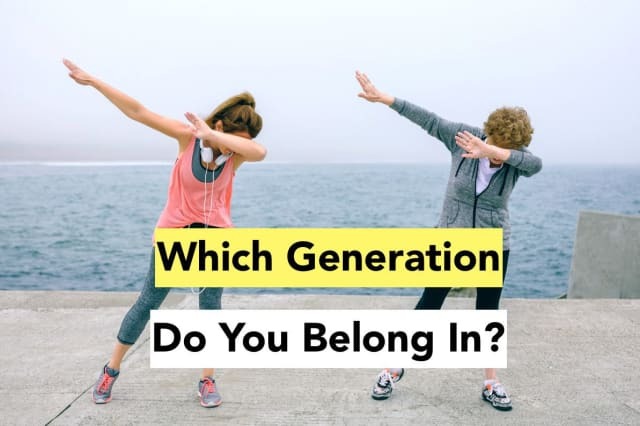 Find out if you're in the right generation! If your country had an army draft lottery? What would you do if you were picked? I would go. It's the right thing to do. Would you like to get married one day? You find a $100 bill blowing along the street, with no one around and no chance of finding who it belonged to. What do you do? Do you trust politicians to do the best for their constituents? How old were you when you moved away from home? Do you consider your current job to be your life-long career? Do you think Donald Trump is a better president than Obama? Despite your age, you belong in the "Baby Boomer" generation. You would have been born between the years 1946 and 1964. It's called the baby boom because families reunited after the war were catching up for lost time and having as many babies as they could. Baby boomers lived through the Vietnam war, giving them a deeper connection with their patriotism. Unlike their depression-era parents, they expect their retirement to be full of luxury, travel and a steady pension. You're the type of person who goes with the flow. You just wanna have fun more than anything else. Despite your age, you belong gin the Gen X generation which includes people born between the years of 1965-1980. Gen X is often described as being the generation "between" the two major generations, Baby Boomers and Millennials. This generation is the first to have grown up with possibly distant or absent parents. As a Gen Xer you are smart and hard working, you tend to put your career over anything else. Despite your age, you belong in the millennial generation. Born between 1981 and 1996 - this generation lived through the September 11th attacks. Coloring their worlds forever. They tend to go against the fray, reject nationalism and choose individuality over being apart of a group. Despite your age, you belong in the iGen generation or "Generation Z". Anyone born from 1997 onwards is apart of this generation. These kids have never lived in a world without internet and can be found glued to their phones. They are the generation who most values self expression...possibly also the most self-absorbed? We'll see.